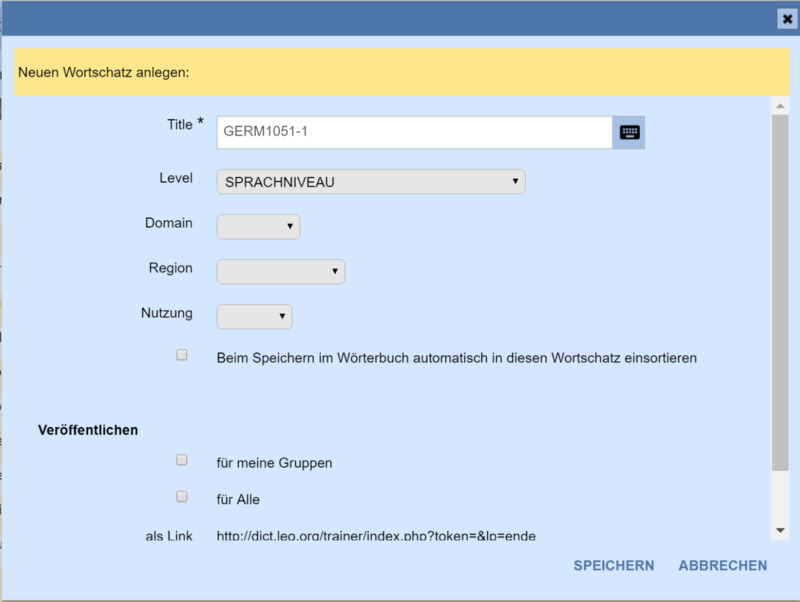 Sprachtrainer Step 2: How to study my words? You have now done your assigned reading. You have looked up many words using Leo.org while signed in and you have saved the words by clicking the disk symbol to the left of the word. Now you want to study the words. Ideally, you will download the LEO Smartphone App to add words while reading, add words while in class, and study the words quickly and effectively walking around campus. But you will need to set up a few things using the standard web version of LEO first. First thing you will need to do is organize the words into a group for that upcoming test (e.g., Vokabeltest3). Click the “Trainer” link at the top of the screen (see below). This brings you to the homepage of the Sprachtrainer. 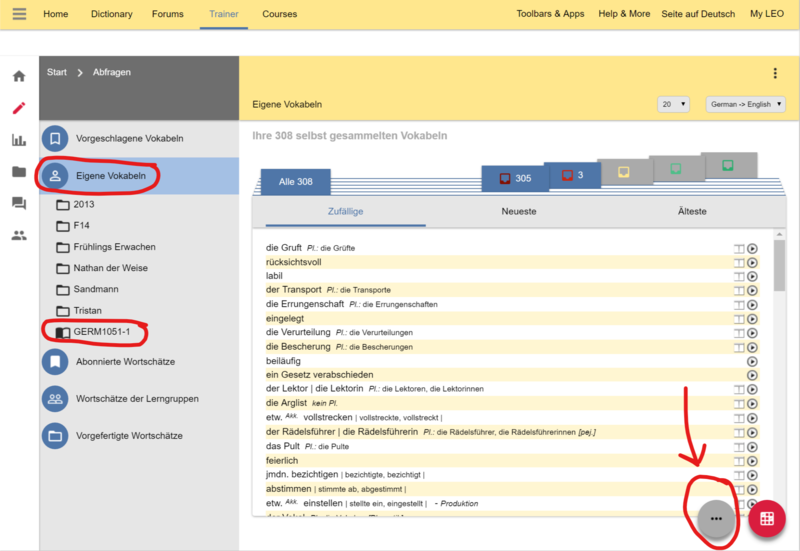 Then select “Edit word lists” (Vokabeln verwalten) at top in the middle. Click “New Word List” (Neuer Wortschatz). Give the new list a name like “Liste 1” or “GERM1051-1”. Save it by clicking “Speichern” at the bottom. Once you’ve saved this list, you will now have the option of adding the individual words to it. Select the check box at right under the column with the title of your list. The word is automatically saved. You can use this checkbox system to choose which 20 words you want to study. You can then delete the remainder using the trashcan icon at right of the other words. Ideally, you will download the LEO Smartphone App to add words while reading, add words while in class, and study the words quickly and effectively walking around campus. Using the App is the cleanest way to studying the words with the fewest amount of clicks. Below are the instructions for using the web browser version. 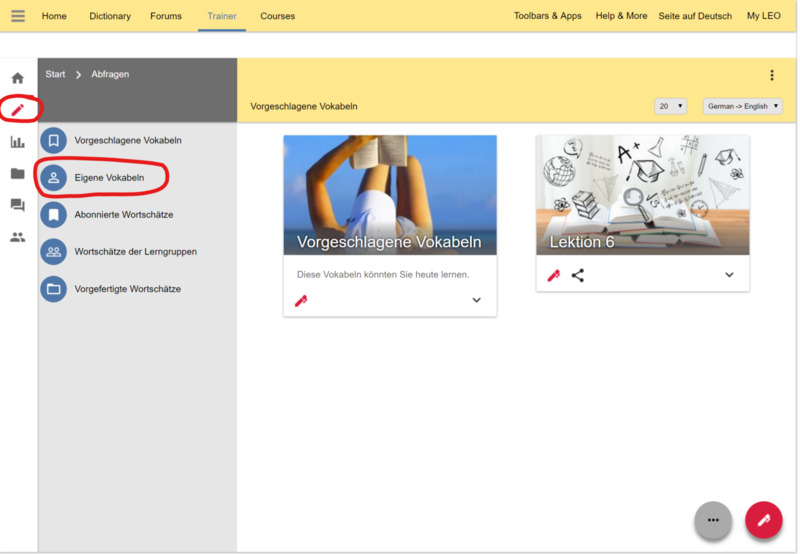 To study them in the web browser version, click the pencil at the left, “Einprägen/Abfragen” (Review/Learn). Next, click “Eigene Vokabeln” (Own Vocabulary). 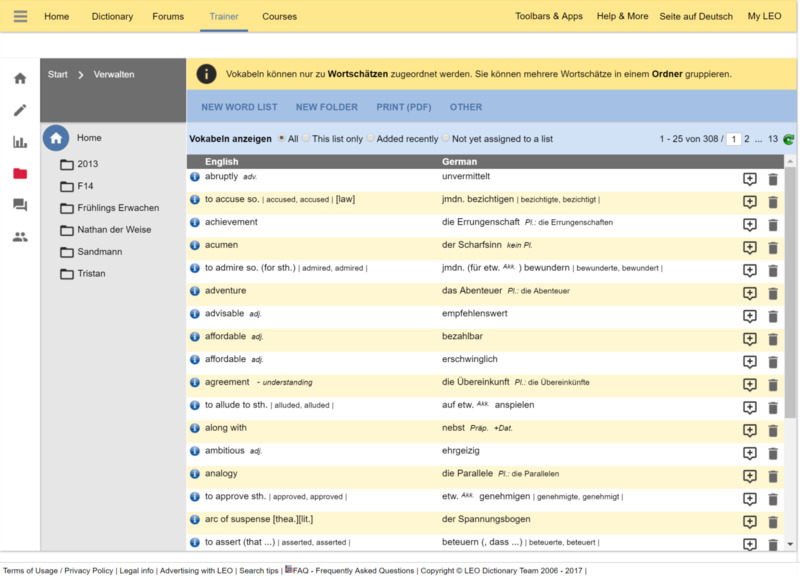 Next, click on the vocabulary list you are currently working on (e.g., GERM1051-1) at left. Finally, you need to choose HOW you will study your words by choosing the ellipsis at bottom right. This opens up a menu for you. Here is a synopsis of your options for how to learn the vocabulary. NOTE: You will want to first learn new words in the German -> English mode in order to build a passive vocabulary. And then you should switch to English -> German mode to build an active vocabulary (more difficult). To switch this, there is a menu option at the top of every game. Viel Spaß!